How to read 箕 (mi/mino）? Are these just different readings or is there a meaning difference? Why is 箕 transcribed as みの in this sentence while according to the dictionary (with the meaning of winnow; winnowing basket; winnowing fan​) it is read as み? 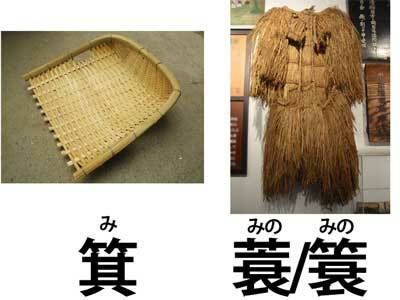 Usually, 箕【み】 refers a winnowing basket made of bamboo. 蓑【みの】/簑【みの】 refers to a straw raincoat. In this context, this みの obviously refers to the latter. But I'm not sure if it's an outright typo. As proper nouns, a person called 箕谷【みのや】 and a station called 箕谷【みのたに】駅 exist. So in the old days when kanji usages were not standardized, 箕 might have been also used to refer to a raincoat. Not the answer you're looking for? Browse other questions tagged meaning readings or ask your own question. How to read these algebraic formulas? How do you read these kanji 年々? Are there differences in meaning or formality in the various readings of 家中?